Marky saved the day by throwing down a set for a party we threw together last minute. He showed up a day early to verify the equipment, was all prepped and ready to go before we kicked it off, and then threw down an amazing set - couldn’t of asked for a better experience!! Going into the last week of my wedding planning, I was pretty stressed out with all the unfinished details. There were constant texts, emails, and phone calls from so many people and to be honest, I had reached my max in patience. Marky was that vendor who was calm, kind, polite, and respectful in all the communication with me and husband. And I very much appreciated that. And he was an excellent DJ. 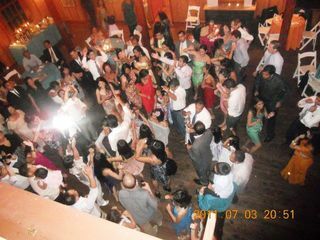 The guests had so much fun dancing and we had so much fun. Marky offers competitive pricing without sacrificing quality or professionalism. I highly recommend him for equipment rentals and other DJ services. Marky did a fantastic job at our event! He came prepared, on time, accommodated all our crazy needs and played the best music. We had a blast! Can’t wait for the next event and strongly recommend Marky for yours! 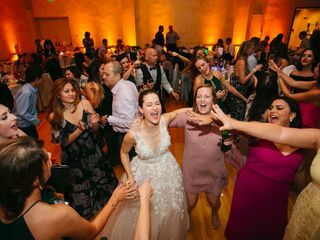 DJ Proof AKA Marky made our wedding such an awesome experience! From the date we inquired about booking until the minute the wedding was over - he was so responsive, helpful, nice to work with and professional. Everyone had a blast dancing to his music and he was so great about incorporating a mix of Latin, Italian and family-friendly music! He's the best and I highly recommend him! Marky DJed two of our wedding events and people couldn't stay off the dance floor! It was truly epic and I am so so so happy that Marky could be a part of our big day. Here are some of the biggest reasons Marky was the best: 1) He is super responsive and down to earth. Doesn't try to sell you at all and really is interested in wanting to understand your event. 2) When he realized our venue required several sets of speaker systems-he adapted really quickly and found very reasonably priced rental equipment. 3) He took all my music likes and dislikes and played incredible music. There wasn't a song on all night that I didn't want to dance to. 4) It's so rare to find a DJ that actually mixes and doesn't just cue up songs these days. MARKY IS INCREDIBLE...he mixed all night and some of my guests even asked me for his contact info for their own weddings. 5) Marky is not cheesy at all...he made announcements when necessary but he didn't do a lot of the gimmicky things that many DJs do and that was super important to me. His music spoke for itself and got the crowd going! I can't recommend Marky enough! If I ever need a DJ again, he will definitely be who I call. Even though we live on the east coast, Marky was great in helping us to coordinate our event from 3 time zones away. Thanks Marky! Marky has produced and played at all of my favorite annual parties in San Francisco for over a decade. 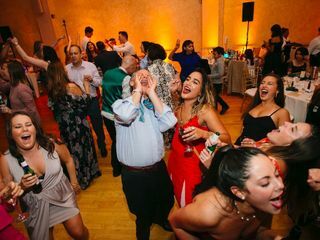 His professionalism, flexibility, and excellent music selection made it a no brainier to hire him to rock the most important party of my life, my wedding reception. Our reception space was non-traditional, but he made it work. I highly recommend Marky! Marky was in charge of coordinating our music and sound for our wedding reception. 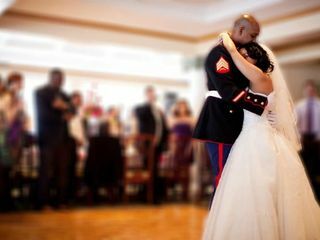 He was truly a pleasure to work with throughout the entire process before and during the reception. After an initial meeting and sharing of our musical tastes and a sample playlist of songs we liked, Marky put together an amazing musical set as lead DJ for our reception. He worked with our reception vendors directly to discuss logistics of sound setup, required equipment and load-in and load-out details in a professional manner. It was so seamless that it felt like magic, as we did not have to worry at any point about any of the details nor did we even have to talk to anyone about music and sound for our wedding reception. He is truly an experienced pro and he has the utmost skills as a music curator. Our guests loved the music and had a blast! He also brought and helped to setup the sound equipment necessary for our toasts and announcements from our emcee, which was wonderful as well. I highly recommend Marky as a DJ for your wedding! 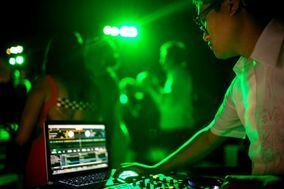 He is a skilled DJ with a ton of experience both with weddings and with other parties and events. My husband and I are so grateful to Marky for DJing our wedding. Not only was he patient in receiving information from us as a frazzled couple in the weeks leading up to the big day, but he was also incredibly responsive to our music requests. (My husband is a former DJ so he has strong opinions about music--Marky was super accommodating!) Marky's music catalog/selection during the reception and cocktail hour was on point, and he was also a great MC during the reception, which allowed that portion of the day to go off smoothly. Overall, working with Marky was seamless and brought much needed calm to the frantic nature of wedding planning. His music and energy also brought even more joy to our special day. I'd HIGHLY recommend working with Marky and hope we get to enjoy his music again in the future! Marky was so easy to work with. He understood our style and vision. He has an extensive range and exceeded our expectations! Marky is awesome, to say the least. Super easy to work with and very accommodating. You wouldn’t be able to tell from his casual appearance, but he has a WEALTH of experience. Great MC if that’s something you require as well. But his bread and butter, i feel, is his passion for music. Well versed and knowledgeable about a plethora of music genres - he’s the perfect choice for any occasion with a varied range for all musical tastes. All our guests couldn't stop gushing to us about how they loved the music at our wedding reception! He had everyone on their feet and partying into the wee hours. Very easy to work with, on time and professional. Highly recommend! I've worked with Marky on a few events and he's always been responsible, professional, and a joy! His music is always on point and he knows what to play to set the mood you need. Marky and his team were amazing and were very collaborative on the sounds and vibes we were looking for. A combination of great music selection and professional operation. Marky was the perfect and such a great person to work with. He took the time to talk with us to put together a playlist of songs we loved - every song meant something to us and had everyone dancing all night long. He also picked the perfect background music for dinner. We didn’t have an official MC and Marky was amazing - he hit all the schedule cues for speeches, dinner, etc in such a natural way we never felt herded or interrupted. Of all the things to juggle on the day, he was one element we didn’t need to worry about, micromanage, or cringe at the pricetag. So lucky! Top to bottom, he was a pleasure to work with and we still listen to the playlist! Solid pick. Marky is the best DJ / wedding DJ ever. knows how to rock a party for the alternate wedding party crowd...not your standard cheese... keeps the reception rocking like a night club. Marky was amazing! He took the time to survey the space with me before the day of the event to ensure everything can be set up and created as planned. He followed all my playlist requests and more! He knew exactly what to play to get the party going and keep people dancing. I’d highly recommend him! Marky is literally the soundtrack you want at your wedding. He consulted with us one-on-one, listened to our music tastes, track suggestions, but most importantly, discussed the atmosphere that we wanted to create. Bringing in his music knowledge and ability to drive any party, he threw the best dance party I've ever been to. EVERYONE was dancing even the old folk! We were so impressed by his music that we want to have another party just to hire him to DJ! Marky arrived on time. Set up seamlessly with the wedding venue. And controlled the pace of the reception. He brought an element to the wedding that really elevated the night, making one hell of a memory for us and all our guests. Marky was great to work with! We sat down together before the wedding and went over all the details, names and information he needed to make sure everything went wonderfully. 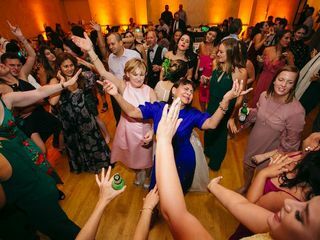 When I think back to our wedding, our DJ is at the center of my favorite moments. Marky was amazing. He helped plan the flow of the entire night and kept it going smoothly- from the introductions all the way through to the dancing and goodbyes. And the music? To this day I have people reminisce over how much they enjoyed getting down on the dance floor. Marky was by far one of the best vendors we worked with. Highly and enthusiastically recommend! 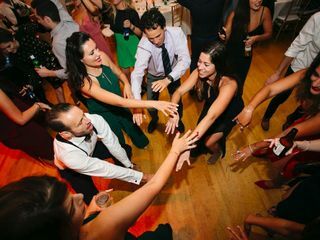 When we planned our wedding reception, we had two main priorities: 1) have excellent food, and 2) have excellent music - the latter being a tall order with the groom being a DJ himself. Marky delivered beyond our expectations - not only providing great music, but he is professional from start to finish in preparation and execution. We’d recommend him with no hesitation - in fact, we have! Our referrals have been very happy with him as their wedding DJ just as we were.